I’ve been religiously tracking Breath of the Wild speedruns since before the game was released and have even started my own attempts. What started as a desperate dash to fight Ganon has changed drastically. Here’s some of the coolest stuff. Watching a new game evolve over time as more techniques and tricks are discovered is an amazing process. Breath of the Wild is a massive game. Completing it quickly is a major challenge. But new developments have made the latest speedruns utterly mesmerizing to watch. And the tantalizing hope for a major sequence break has added a Holy Grail for runners to hunt for. One of the best things about watching Breath of the Wild grow as a speed game is the little glitches that get discovered. The all mix together to alter how you go through the game. Up above, a recently discovered trick allows you to grab a bomb underneath objects like doors. 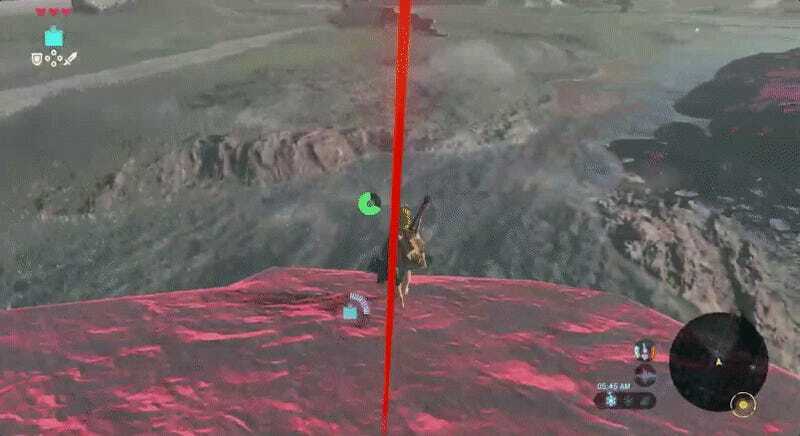 They clip through the geometry and Link can snag them. This makes the game panic and have a physics heart attack, shooting the door up at ludicrous speed. While it remains to be seen if this trick would mean that runners go to the bomb shrine before magnesis, this small glitch has people comparing times on routes and testing where runners would want to go. It’s really awesome to see how exhaustively everything is tested.What’s optimal today might be slow tomorrow as new tricks are discovered. Every discovery has potential to shake things up. Runners and technique hunters are constantly finding new ways through shrines. Alternate routes through dungeons are a key component of the “All Main Quests” category but there’s still tricks that are changing the run for everyone. Up above, a series of tricky jumps allows you to get through the cryonis shrine much faster. Originally, you just ran through the shrine as intended. These little breaks are everywhere and range from a using your shield to leap across wider gaps and some of the wilder, if outdated skips even froze items mid-air to use as makeshift stepping stones to areas that are normally off limits. “All Shrines” runs are not very common at the moment. The fastest is over 11 hours long. But as people find more tricks and even route out a 100% category, these small skips are going to form the cornerstone of some very exciting runs. Hold on, I gotta stop for a bite to eat.. Initially, runs stocked up on weapons and used relatively safe strategies against the Ganon Blights. For instance, you’d leap from the top platform of the boss arena to do slow but consistently safe damage against so bosses. For Thunderblight, you relied almost entirely on dodging and countering. Those strategies were way too slow. It’s actually far better to craft a strength potion to help speed things up. You can use the Toon Link amiibo to get some fish for ingredients. If you don’t have the amiibo or haven’t counterfeited your own, there’s a route through the castle that will get you suitable food as well. 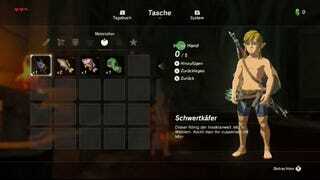 Cooking is one of my favorite things about Breath of the Wild so it’s really interesting to see this mechanic become such an important part of running the game. A banana here and a Lizalfos tail there can turn you into a Ganon-slaying brute. There’s even talk about crafting a speed potion for earlier segments. The risk and reward of incorporating cooking into a run is an interesting exercise in routing where you need to go. It’s tempting to craft all the potions you need but cooking takes time, as does gathering the ingredients. Determining where to use a potion and if cooking takes too long is a fun numbers crunch. One of the developments that I enjoy the most as I watch where Breath of the Wild speedrunning goes is how many stasis launches have been added to runs. A stasis launch comes when you use your stasis ability on an object and smack it a ton. This builds up force that is then released when the power is removed. Using key objects like boulders and trees, runners can fly all over the place. Runs that don’t use an amiibo to get Epona actually use a sequence of launches to reach Hyrule Castle. It’s amazing stuff. The trick up above is my favorite to perform. (And yes, that’s my own clip.) Using stasis to give the slab a bundle of energy and exploding a bomb to send it in the direction I want, I can stand on the slab long enough in the air that it begins to tilt. Once it does, I jump and let it damage me. This sends me through the air, where I pull out my paraglider and land at the exact level of the castle that I want to go. Here, I land in the dining hall to pick up potion ingredients. My first article for this site was on a Wind Waker trick called ‘Barrier Skip’ that would potentially cut a swatch of time from that run. It was thought impossible for years until someone made it happen. Last night, a runner finally recreated it with controller and frame data that might make it something that is consistently reproduced. It took years to reach that point. Breath of the Wild has a similarly exciting skip. The early game has Link stranded on a high plateau. To exit, he needs a paraglider. It’s not just that he needs to glide down. The game actually requires you to have the glider. Otherwise, you will fall into a zone that warps you back to the plateau. Even if you bypass it, there’s another failsafe that will warp you back if you land anywhere on the world map. You need the glider to beat the game. There’s no way around it. But we can dare to dream that a major skip might be found. Reaching the final boss won’t be enough; you’ll void out and warp to the plateau. But if there is a way to warp into the credits, you’d have a much shorter, exciting category that uses that trick. I guess we’ll just have to wait a decade and see what happens. The sky seems the limit on what might be discovered next. From special potion crafting to amazing aerial stunts, there’s a lot of room for this run to grow. I’ll be practicing my own attempts and hope to finish a run before I die of old age. For everyone else, you can just watch the pros break this game in half.